Ribbon noodles in a chicken flavoured sauce with sweetcorn and mushrooms. Make-Up Instructions 1 Empty sachet into a standard size mug. 2 Fill to 15mm from brim with boiling water. Stir thoroughly. 3 Allow to stand for 5 minutes. Top up if a thinner sauce is required. Stir thoroughly again. Now this is a real cosy classic! Keep it warm by knitting yourself a mug cosy! Like it thicker? 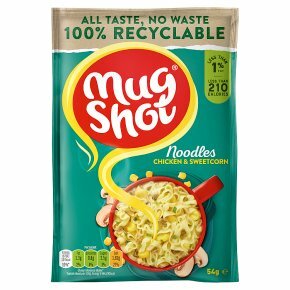 Give it a ping in the microwave for 20 seconds. ...A cosy classic!